Going to a chain pizza restaurant might not be high on your list of ‘to-dos’ when visiting London but make an exception for Pizza Express. There’s lots of reasons people are getting excited about the new Pizza Express store in Richmond, approximately fifteen kilometres from central London. 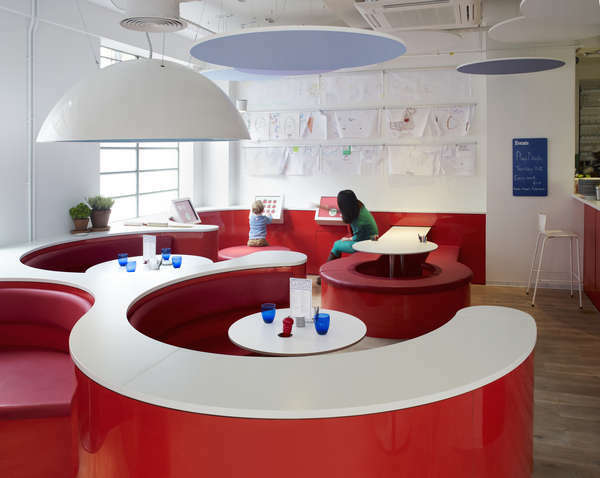 Named the ‘Living Lab‘, the restaurant is an ever-evolving blueprint for the restaurant chain’s future development. The thought behind every aspect of the restaurant’s design is quite astounding and ranges from working with acoustics experts to cut down the noise so that diners you can have a better conversation through to hiring a popular DJ to reinvent the restaurant’s play lists (there is an emphasis on the importance of balancing food, music and conversation). 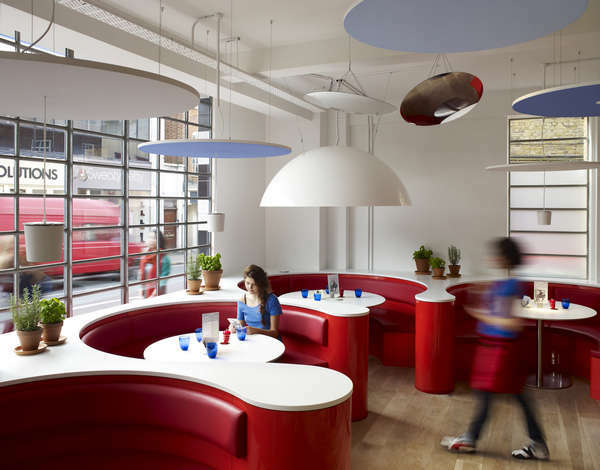 Note the large white domes that float above the red leather dining booths – these ‘lids’ control the noise, light and service for your booth. Each table can adjust their own sound and lighting levels and each booth is also equipped with an iPod dock (should you prefer your own music to what’s been selected by the DJ) and a ‘Serve Me’ button to hail the waiter (the dome above your table glows when you press ‘Serve Me).. There is lots to love about Pizza Express for parents. 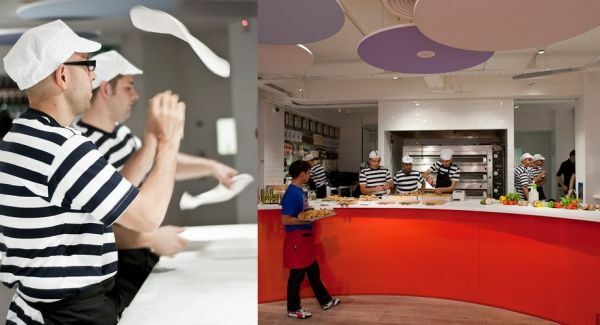 The restaurants hold a popular Play Dough Hour where kids can have messy fun with pizza dough, there’s interactive touch-screen panels for kids in one corner and a big drawing table, as well as the ongoing entertainment provided by the pizza chefs themselves – some parade the floor juggling dough, while others are hard at work in the open plan kitchen. 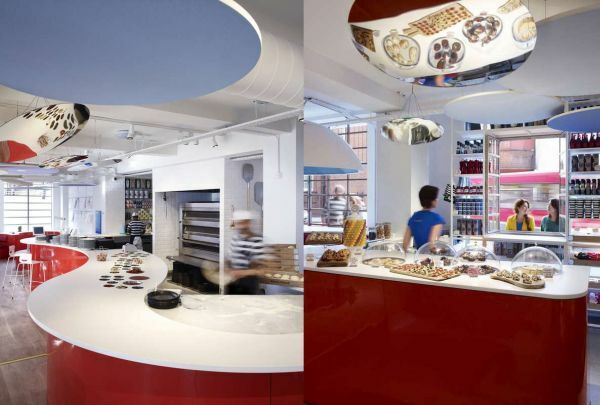 You can see your pizza being made in the mirrors suspended over the kitchen or kids can pull up a stool and watch the chefs at close range. Plus there’s the little things that parents notice (and really appreciate) – wide spaces to accommodate prams, dedicated changing facilities and of course the Piccolo Menu featuring pizza, pasta, bite-sized baked dough balls with Nutella and bambinoccinos. Visit the Pizza Express Living Lab at Lion House, Red Lion Street, Richmond. And if you are looking for a place to stay while in London, check our previous post on The Athenaeum.